I have been spending a lot of time researching parenting for my book about other mothers. No matter what your parenting status is (married, single, straight, gay, adopted, foster, divorced, step, whatever…) there is one common theme: parenting teenagers is not easy. I know when my kids were teeny bopper and pre-teen I thought all those other parents complaining about teenagers were just negative people who didn’t understand teens or maybe parents who spoiled their kids too much. I was sure our kids would be different. We had cool kids that were fun to be around and we were cool parents. I kept telling myself just because everyone else thinks teenagers are evil, challenging or horrible does not mean our teenagers will be like that, we have unique kids. Well, one day reality hit. Almost over night the 3 kids turned in to teenagers. They went from being carefree fun loving teeny boppers to TEENAGERS. Their eyes started rolling at whatever we said, wore or did. They knew everything, we knew nothing. The bedroom doors started shutting the moment they walked in the door from school. Going out to dinner with us or to the movies was no longer fun. You get the idea. Teenagers are teenagers it’s how we react to them that matters. The way I reacted was to get my feelings hurt when hearing things like “um you are not actually going to wear that out in public are you?”. I went from being cool mom to clumsy dork overnight. Parenting teenagers can make you feel like you are in middle school all over again. Parenting teenagers pretty much forced me to grow up and grow some thick skin. During some of the more challenging parental years I used to think to myself, “what happened? I thought I was the kid, these darn kids are forcing me to be the adult”. This party girl from high school suddenly found herself realizing friends of kids 7-11 Big Gulp cups were actually filled with Vodka and not soda. (Hint: parents if your teens have a bunch of friends over who seem to be innocently drinking soda or water, ask for a sip. Be prepared to choke on straight up Vodka.) And when finding Vodka having to poor it out (or make your partner do it), lecture the kids (ie. totally lose it) and become known as the un-cool parent. Let’s just say it was not easy raising teenagers. Fortunately, I have made it to the other side. The youngest is almost 19 and getting ready to head off to college. The older 2 are already in college. Dare I say I enjoy their company now? 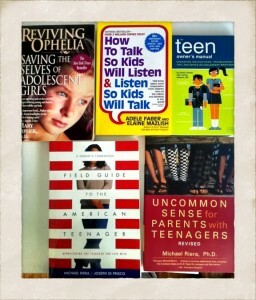 I read a lot of books on raising teenagers. The best advice I can give you if you are about to embark on this journey or are in the middle of it is to take it one day at a time and remember to breathe. You may want to consider praying too if that is not something you do regularly because teaching a kid how to drive is one of THE scariest things I ever did in my life! Parenting teenagers is a very humbling experience. 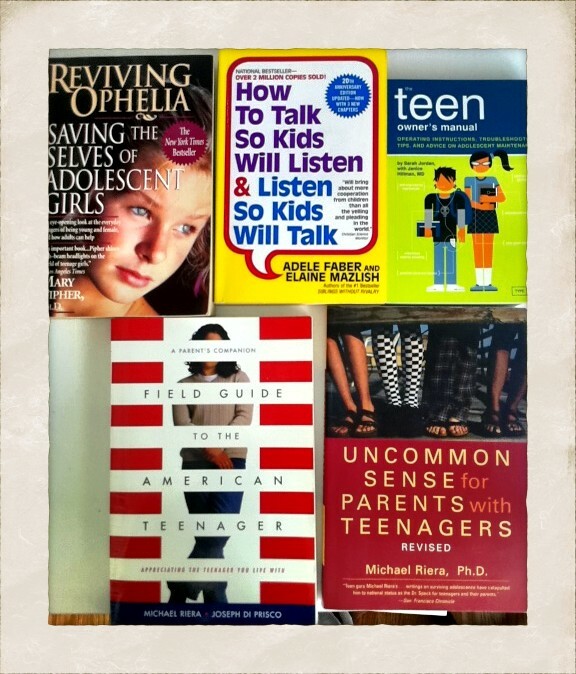 In the picture above are some of the books I read during the teen years. I’d like to share these books with you. If you’d like one please leave a comment below with the title and send me your mailing address with the title of the book. If you are in the US I will ship it to you at no charge. First come, first serve. The only thing I ask for in return is a LIKE on Facebook.